I can't believe that I have intentionally forgot to blog. Well, it's not that I'm beginning to lose my blogging mojo or I'm not feeling emotionally okay to write. A reader actually asked me why I wasn't blogging, she said I looked happy with all my IG posts so she wondered what went wrong. Uhm, is this a good excuse? I felt sluggish these past few days that even turning on the lappy was a daunting task. There. Like what I always post in my Facebook page whenever I'd get too busy to blog, follow me on Instagram! There are nice photos there; not very pro photography-wise but it's about me: food I cooked, my happy little artist, quotes I like and all things Bebeng. Yuhh, I check that first now more than my email. Haha! I told yah, I'll be flooding you with my Queenstagrams. R, my Army kind of guy along with some of his classmates and contemporaries, got promoted to Captain. If there's one person who's very proud of him, aside from his mom and me, it's got to be the girl. Her face and demeanor are indescribable whenever her *Tatay* is home. 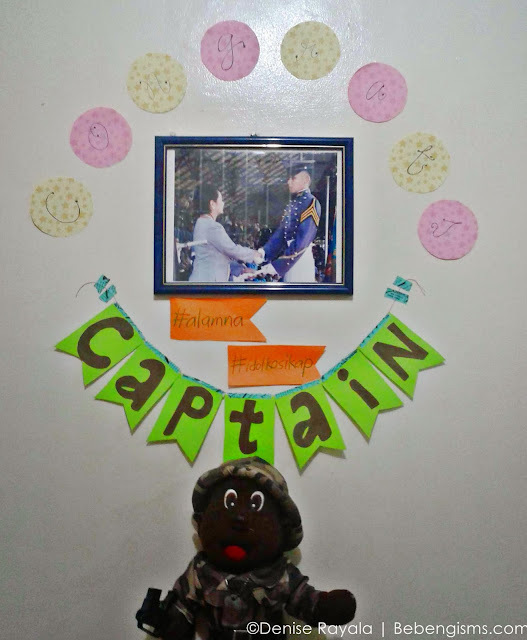 So I did a little butingting to surprise my king and make my princess aware that these little things will make her pop happy. Oh of course, he would reward himself with a booze party for his men next month AND a brand new TV for the house. Yay! But before these merriment and material happiness, we decided to go back to Potipot Island in Candelaria, Zambales to celebrate his promotion. This time, we tagged along the other woman who helped him become who he is now - his mom, Mama A. 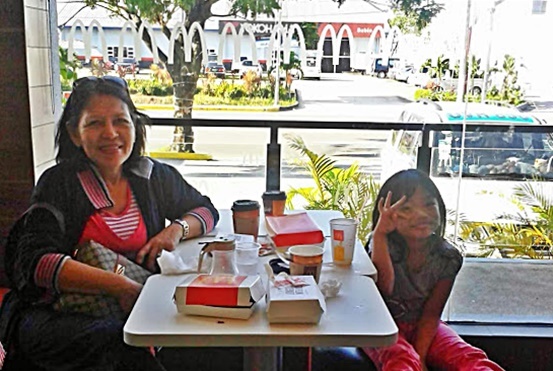 Since Mama A now has 7 grandchildren (soon 8), I was really happy to see her and my girl having some "Downtown" moment in Mc Donald's in SBMA, where we had our breakfast. What a lovely sight. The MIL also got to open up some family issues. I like that we're now treating each other as friends. Naku muthers, we almost wanted to kill each other when we were still living with her, haha! That's why I always advise those who have problems with in-laws (especially if they live in the same house) to get a kingdom of their own. You can never have two queens at the same time, you know. Hihi. That was the past. I know naman now that she loves me to bits. She even dropped by here last Saturday to give me the skirt she bought for me. Ang ganda, so uso! But sadly, due to my mala-space ship na balakang, hindi siya nagkasya. Okay, issue sa akin ngayon ang size ko. But that will be on another post. I will share with you some photos from our weekend in Zambales. I was the photographer so there weren't enough photos of me. It was more for Mama A - ang retiradang hashtag medyo donya. Are you a woman of substance? Sangobion wants you to be an Iron Lady!